Jeffrey Aceves had rich research experience at UC Merced, which he credits with contributing to his success. Jeffrey Aceves is an excellent student. Always has been. He graduated high school with a 4.3 GPA and an Eagle Scout ranking. He graduated from UC Merced in 3 ½ years, having come to the campus with 20 college credits already completed. The Bakersfield native is driven, dedicated and not afraid to push his personal envelope. He was named Outstanding Bioengineering Student of 2018, was a finalist for the UC Distinguished Leader Award, has already co-authored one published academic paper and graduated with honors. Now he’s headed to Harvard University to earn his Ph.D. and make a difference in the lives of people with kidney complications. Aceves (bioengineering, 2018), thought he was going to be a doctor until he realized seeing patients wasn’t for him. New at UC, Aceves immediately took control of his college career. He found or made opportunities for himself, from leading other students in his residence hall as director of activities and helping found a fraternity to applying for and getting a slot in Professor Jennifer Manilay’s lab, where he co-authored a paper for the Journal of Immunology. 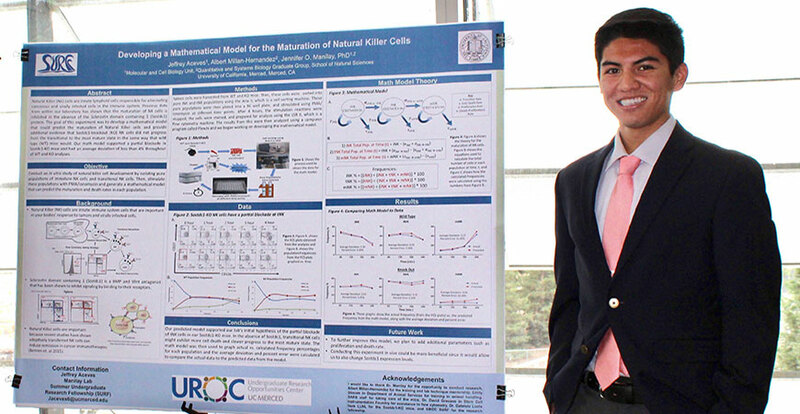 And every time internships or fellowships presented themselves, he jumped, from the Undergraduate Research Opportunities Center’s Summer Undergraduate Research Fellowship and stepping in to learn about stem cell biology from David Gravano in the Stem Cell Instrumentation Foundry, to a stint in KURE, the Kidney Undergraduate Research Experience — where he found his calling. He learned that not only does he enjoy research, he has a passion for helping solve kidney issues. Starting this fall at Harvard, he’ll be working with Professor Jennifer Lewis, whose lab is working on developing an artificial kidney using 3D printing. Aceves wouldn’t have known about Lewis’ lab if it weren’t for another internship that took him the University of Alabama at Birmingham for a summer, where he discovered that his time in Merced allowed him “hang with” students from bigger, older universities, such as Cornell. “It was a whole new level of competition, but I had gotten a great education here, plus I was far more prepared for the lab setting,” he said. After winning second place in a poster competition, he presented at a National Institutes for Health conference where Lewis was a guest speaker. Aceves has been accepted to several other Ph.D. programs, but plans to accept Harvard’s offer of full tuition, fees, health coverage and an annual living stipend. After graduate school, he hopes to find a faculty position at a research university, and said he hopes to return to California so he can be a mentor for students from underrepresented backgrounds. More about Engineers Week and UC engineers can be found online.